​This past December I found myself travelling back to the UK at rather short notice. Living in Auckland there is a wide choice of possibilities flying this route nowadays and you can go via the US, Asia or the Middle East. 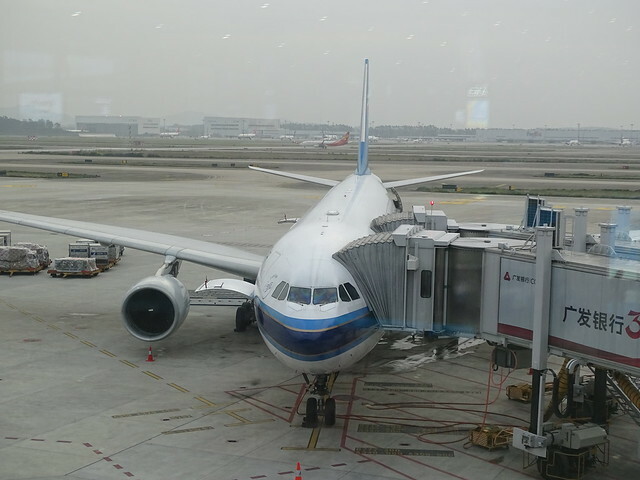 We chose the cheapest option, which was with China Southern Airlines via Guangzhou. Although the cheapest it almost certainly wasn’t the worst and spotting at CAN was something, I was keen to do, at least for the few hours of my stopover. Here’s a look at CAN. ​From Auckland to get to Europe you can nowadays fly across the USA (with United or Air New Zealand), across Asia (with Thai, Korean Air, Malaysia, Cathay Pacific or Philippines), through the Middle East (with Emirates or Qatar) or through China (yes I now it is also in Asia). 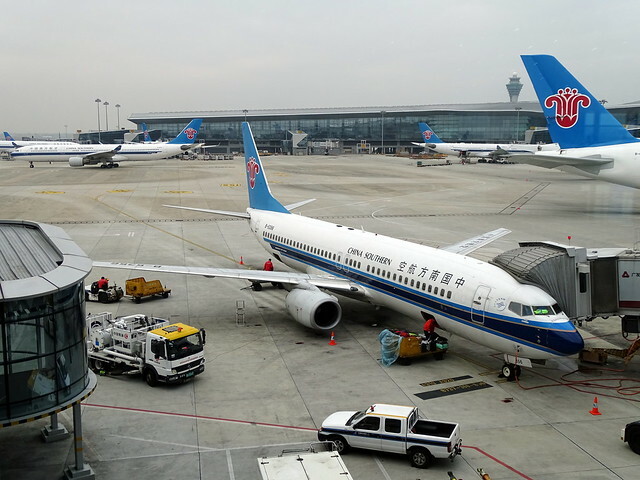 The latter option has an impressive six airline choices to choose from (Air China, China Eastern, China Southern, Hainan Airlines, Tianjin Airlines and Sichuan Airlines). So there is plenty of choice. Since we booked late it wasn’t cheap and so we went with price, which usually means either Malaysia or one of the Chinese airlines. Terminal 2 is in red in this shot. 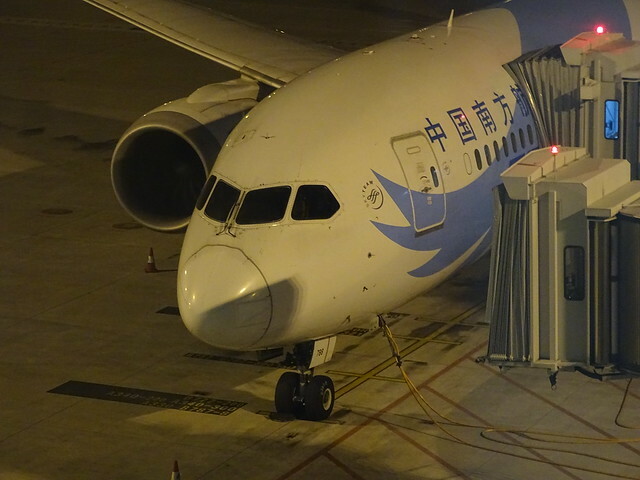 It opened in early 2018 and is mainly China Southern. The lower half is the international bit we were in with two piers and the central gates. I’m fascinated by Chinese aviation so choosing CZ wasn’t a bad option plus it meant flying on almost new Boeing 787s with a good onboard product. Guangzhou Baiyun is a nearly new airport (by Western standards) having opened in 2004, whilst the new Terminal 2 opened only in early 2018. Guangzhou itself is within the Guangdong province, which itself is in Southern China less than a few hundred kilometres from the huge cities of Shenzhen and Hong Kong. 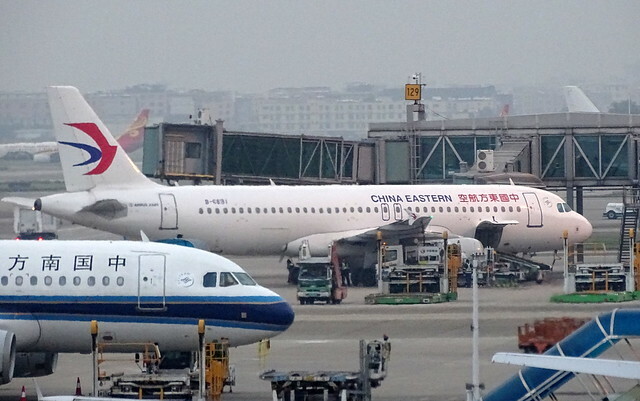 Guangzhou was formerly known as Canton hence the airport’s IATA code is still CAN. That's a lot of CZ at T2. Our flight left, CZ0306, Auckland at 23:00 on Saturday December 15 and arrived at Guangzhou early in the morning on the Sunday 16th whilst it was still dark. 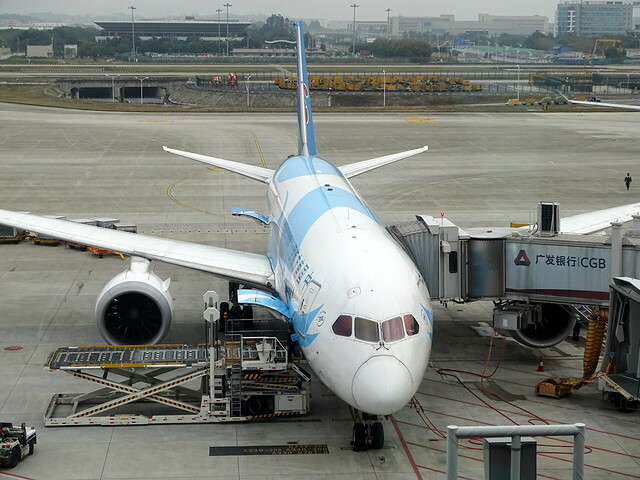 Our aircraft was the nearly new Boeing 787-9 B-1242, which was delivered only on April 30, 2018. The flight was on time and landed on runway 02L. With all the lights and the aircraft windows taking photos whilst taxing was not very successful but it was immediately obvious that this was China Southern’s homebase as there were rows of CZ A320 and 737 family aircraft waiting their first duties of the day. A T2 schematic. The two piers to the left are domestic and separated from the rest. As we were only transiting through the airport we could not go through immigration and so were rather stuck in the international side of the new Terminal 2 for the 3 hours we had between flights. Our 787 pulled into gate 168 and it was quite a long walk to the transfer point, where you had to go through security again, but once past that we were let loose in the departures level of the terminal. It is a very modern and open space with a lot of windows to the airside. Inside the terminal it is rather spartan and there is a lot of empty space, which makes it seem rather characterless (unlike Singapore and Seoul), but then again there were no separate gate lounges either to impede views and there was plenty of space to avoid other travelers too. Surprisingly airside there aren’t a lot of shops or eateries and even when you did find them most didn’t accept foreign credit-cards (even McDonalds, although BK did). On the spotting front China Southern dominate Terminal 2, even in the international side, which is used by some but not all international airlines. 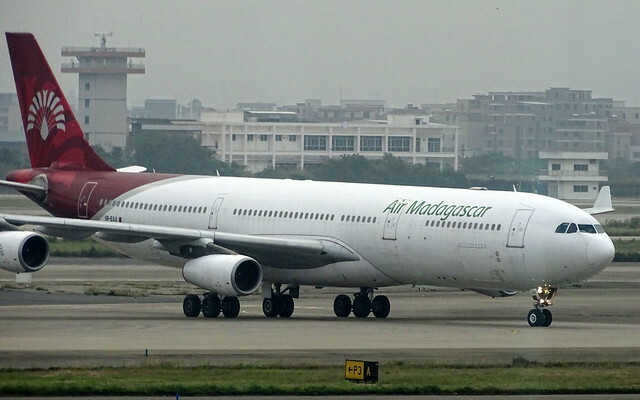 In the time I was there foreign airlines were few and far between and only from Asia and Africa. The latter is very surprising but talks to China’s power and investment in the African region. ​Spotting was possible from almost everywhere in the terminal but the best vantage points for the runways 02L and 02R were the ends of the piers around gate A157 and A148. The problem is one of reflections. Common to most airports all the internal lighting reflects annoyingly off the windows making photos really difficult. You find yourself searching for tiny parts of the window in the shadow of pillars and such. Outside the weather was overcast (or the air pollution was just appalling, I’m not sure which) and that didn’t help photography either but as it got lighter the photos improved a bit, especially when the external lighting was turned off. Above: Probably the best spotting was from the pier ends overlooking two of the active runways, like gate A160 here. Note the FedEx ramp in the background. Also note annoying reflections. 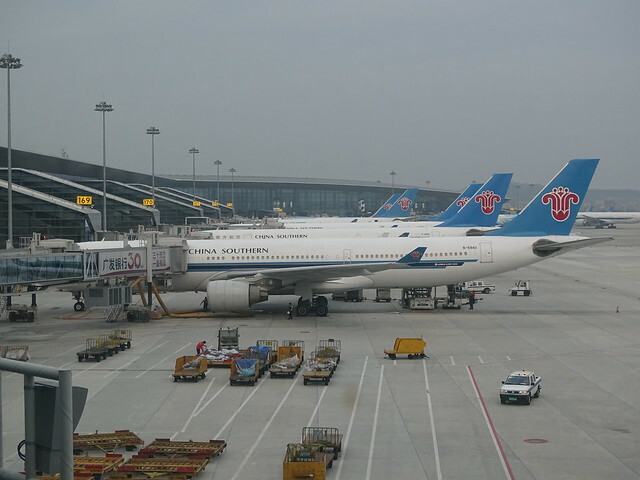 ​Terminal 1 on that side of the airfield seemed mainly to cater to China Eastern Group airlines so traffic on runways 02L and 02R was mainly China Southern and China Eastern with a sprinkling of HNA Group and Sichuan Airlines. The latter was the only non-CZ Chinese airline who used the T2 international gates. Above: Looking beyond the overnight parking ramp one side of one of the three right side T1 piers could be seen. With traffic like this MU A320 at it. Overall opportunities for spotting were good, if limited, and opportunities for photographs limited but possible, albeit not at the quality you might want them to be. On the return leg of our journey we had a much longer layover but perversely the majority of the 7 hours or so was during the dark hours so photography was very limited, and traffic quite infrequent too. We also caught exactly the same Boeing 787-9 on the return CAN-AKL leg as we'd got on the first leg. The outbound CAN-LHR leg of the journey was served by an older Boeing 787-8, B-2788. The flight was fine but the IFE was inferior and older than that on the 787-9. It for example had a remote and the headphones plugged into the seat arm whereas on the 787-9 it was touchscreen and the headphones plugged into the seat in front. Still it was perfectly reasonable for economy class. Below: B-2788 just prior to boarding the plane. The return leg LHR-CAN was also on a 787-8 but this time sistership B-2733 took the journey. That brings me to the end of this introduction to the Guangzhou T2 experience. In part 2 I'll look at what traffic I actually saw.